For associated Good Station (Grain Store) at NS 2480 5921 6595, see NS56NE 2480. For associated (approach) tunnel (NS 59515 66320 to 59836 66555), see NS56NE 2931. The Station was opened 1.11.1849, modernised 1862, 1865-1869, 1904 and 1932, and closed 7.11.1966. 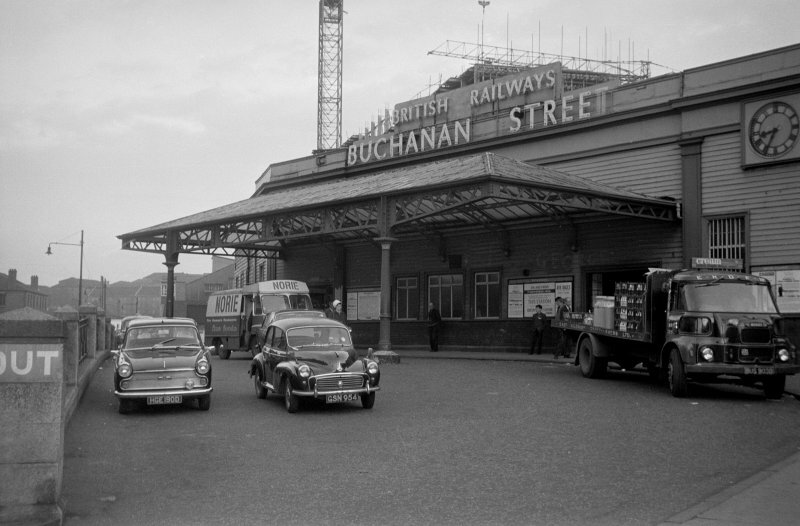 Buchanan Street Station, Port Dundas Rd., opened 1 November 1849 by the Caledonian Rly, and subsequently rebuilt. 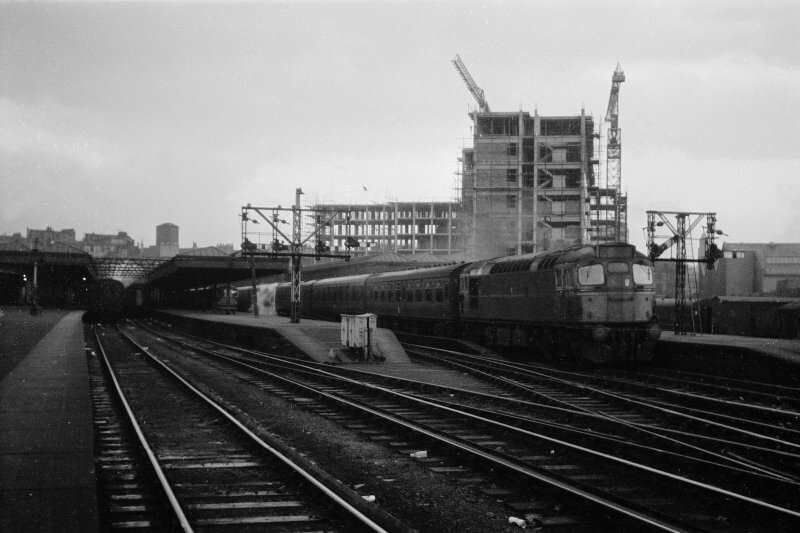 The passenger station as it existed at closure (7 November 1966) had three island platforms with iron-framed, wooden terminal buildings. 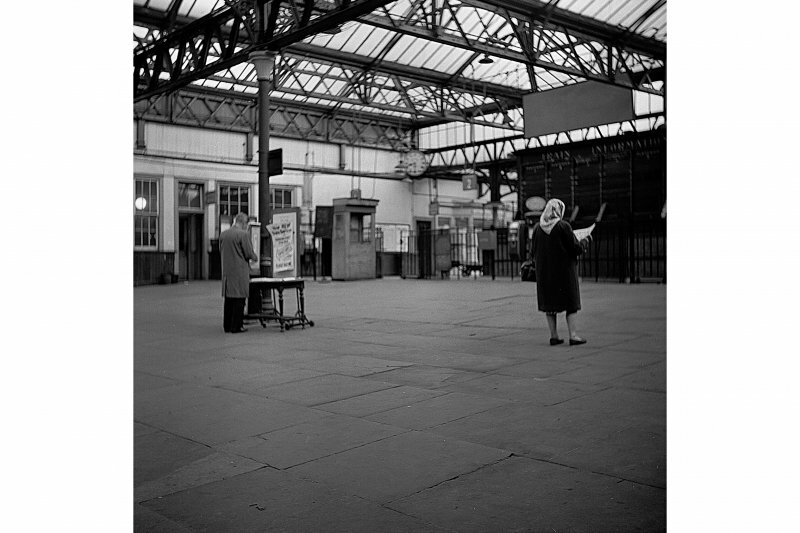 There was an awning over the main entrance, a carriageway on the S side, and separate iron-framed glazed awnings over the platforms (erected 1932). 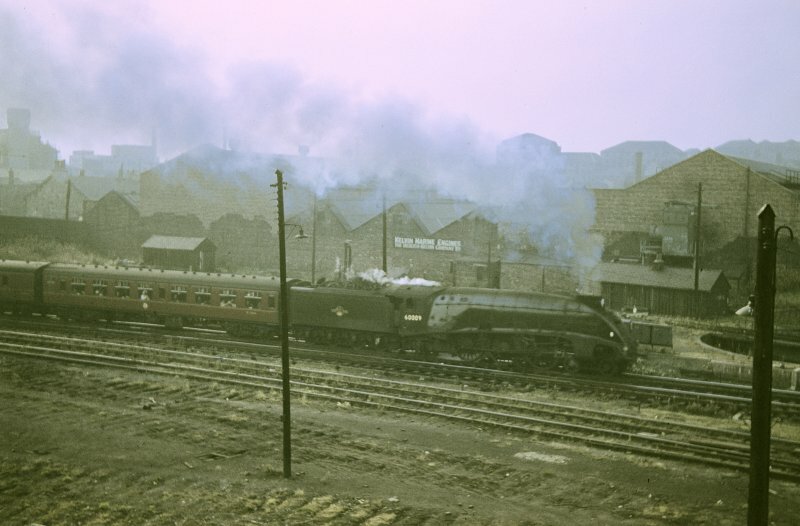 To the S and E was an extensive goods yard with sheds added 1891 (£15,000) and 1906 (£89,400) and a five-storey, 5- by 20-bay grain store, probably dating from the 1870's. Part demolished 1967, rest by 1971. 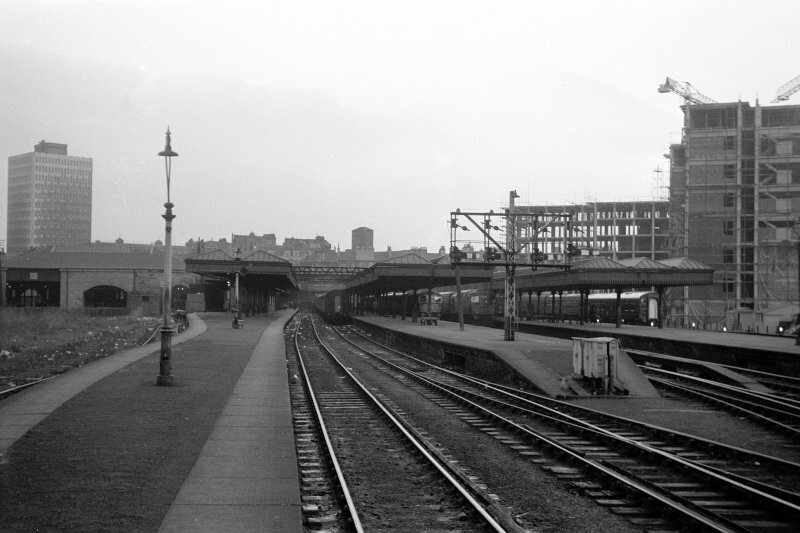 Variously described as 'the gateway to the highlands', 'a country station in the city', 'a slum terminal' and 'the most abominable [station] in Western Europe', this was the second (and by far the lesser) terminal of the Caledonian Rly in Glasgow. It was initially significant as that company's first foothold on the North bank of the River Clyde, but was not used by English traffic after the opening of Central Station (NS56NE 77.00) in 1879. Its low standing and unpretentious nature arguably reflect the precedence given to the construction of Central Station and the juxtaposition of passenger and goods facilities on a single site. Construction of the station was occasioned by the controversy surrounding the building of Dunlop Street Station (NS56NE 1348), and it opened on 1 November 1849. As at Dunlop Street, the architect was William Tite and the design was Italian ate in style. It was for a time referred to as the 'Garnkirk Station' (construction having been initiated by that company), and the construction of its approach involved considerable engineering difficulties, being on a steep gradient with long stretches of cutting and a tunnel (NS56NE 2931). There were only two tracks in the tunnel between the station and St Rollox. 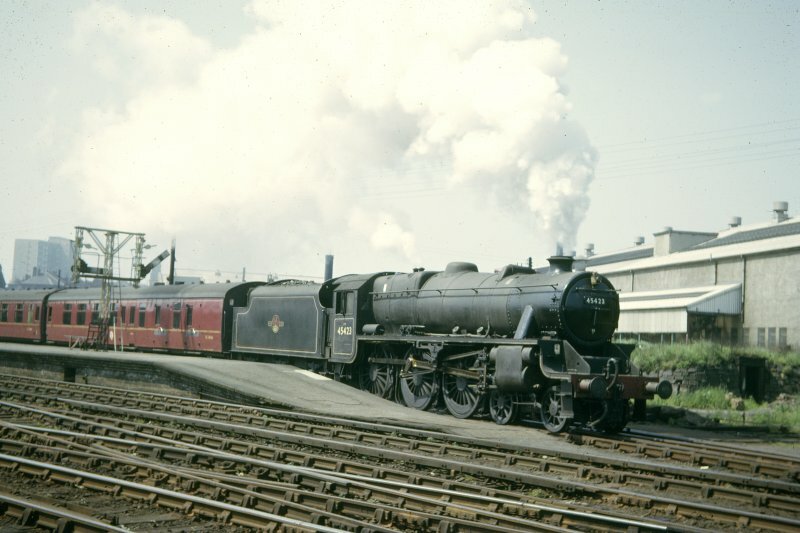 These were controlled by a manual box of 98 levers within the station itself, and a subsidiary box at St Rollox. The original building was a 'sorry affair' which apparently had a long and a short platform with a small bay, end-loading facilities and several small turntables. The structure apparently incorporated unused portions of iron roof intended for installation at Lothian Road Station (NT27SW 189.01), Edinburgh. 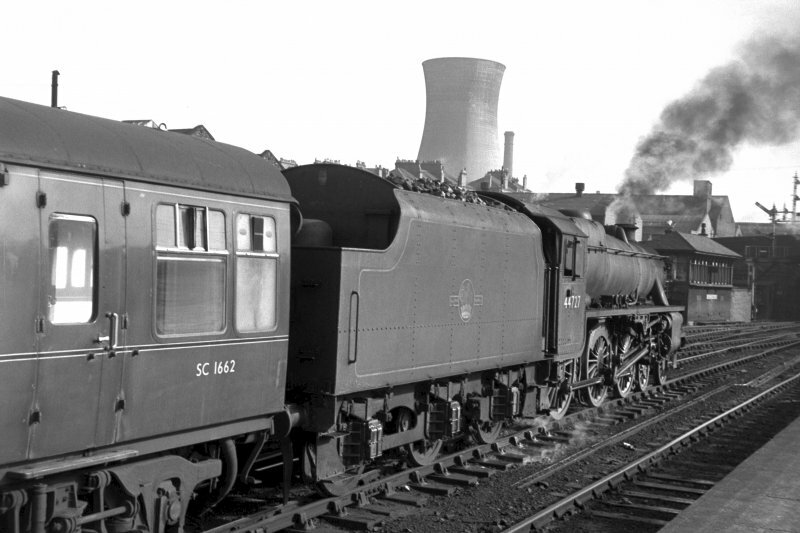 Tite ceased work for the Caledonian Rly amidst litigation over his fees, which was resolved in his favour. Construction of a hotel was authorised, but never carried out. On 4 November 1857, a design competition was announced for a proposed new passenger station and offices. Most of the 63 designs received were rejected on grounds on grounds of cost. The first prize went to J T Rochead of Glasgow, under the title 'Caledonia Romana', but no reconstruction was carried out. Further submissions were made in 1867 and 1869 by the Edinburgh architects J M Wardrop and Peddie and Kinnear, but these were not implemented. 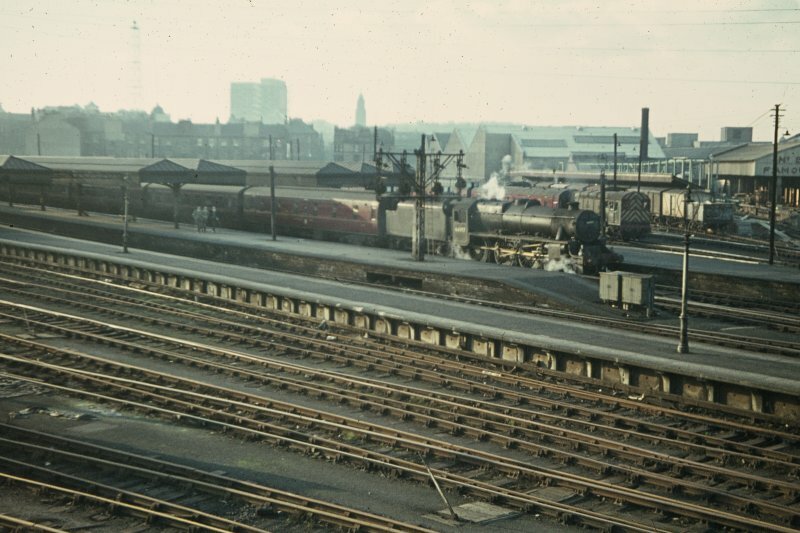 Eventually, George Galloway, the Caledonian's engineer-in-chief, decided that the adjacent goods terminal should be expanded enormously, but the passenger station should be written off as a lost cause. Alterations were, however, made to cope with increased traffic. In July 1862, the arrival platform and canopy were lengthened, while in the following year the parapet walks were raised at Dobbies Loan. 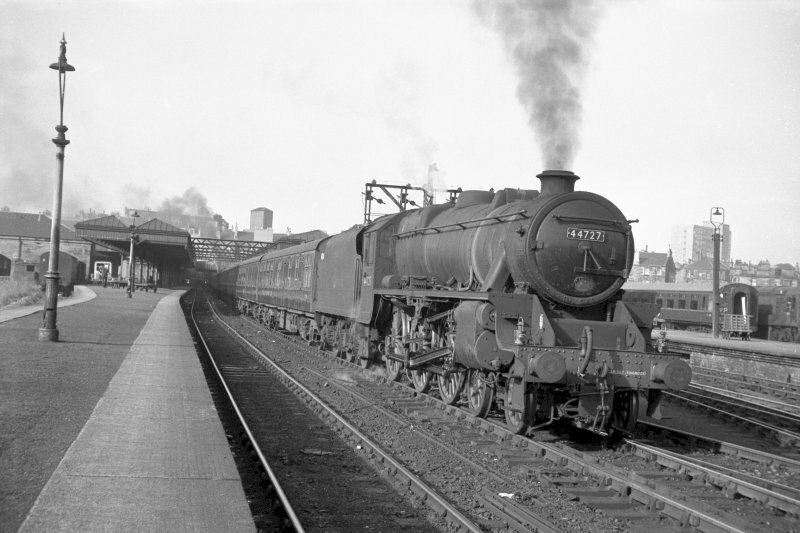 In 1865-9 the largest extension was made so that trains from Stirling and the North could be handled (from 1 January 1870). During this work, an exit was constructed at Parliamentary Road, and the platforms were raised. A refreshment room was provided by 1882, having been previously proposed in 1858. During the 1890's, Buchanan Street station held a low position within the Caledonian Rly's assets. 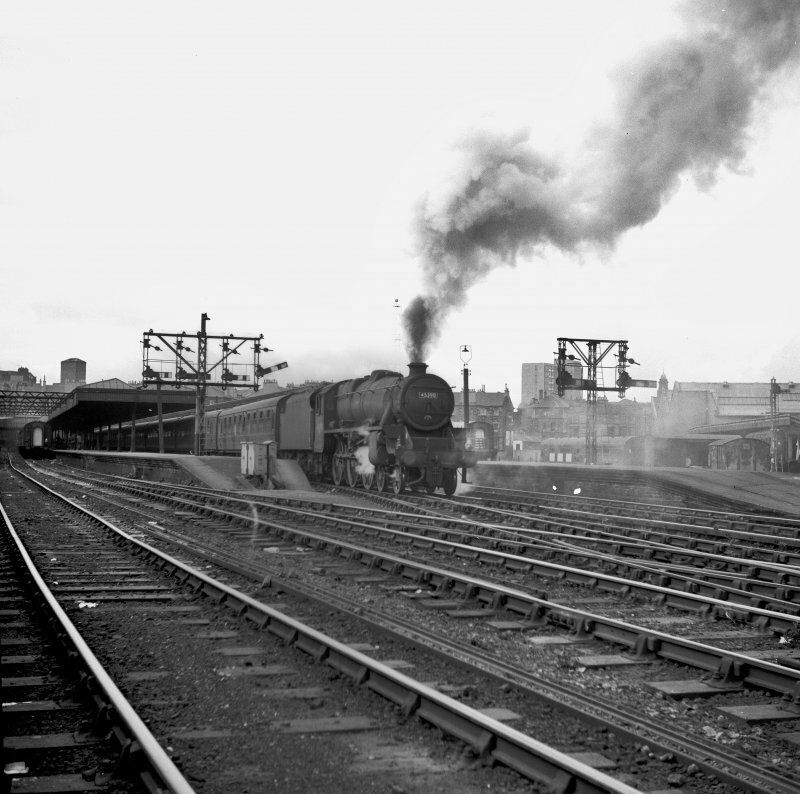 In 1897, the number of passengers booked as 808,252; this had dropped to 775,569 by 1902, but rose to 1,104,971 in 1908. 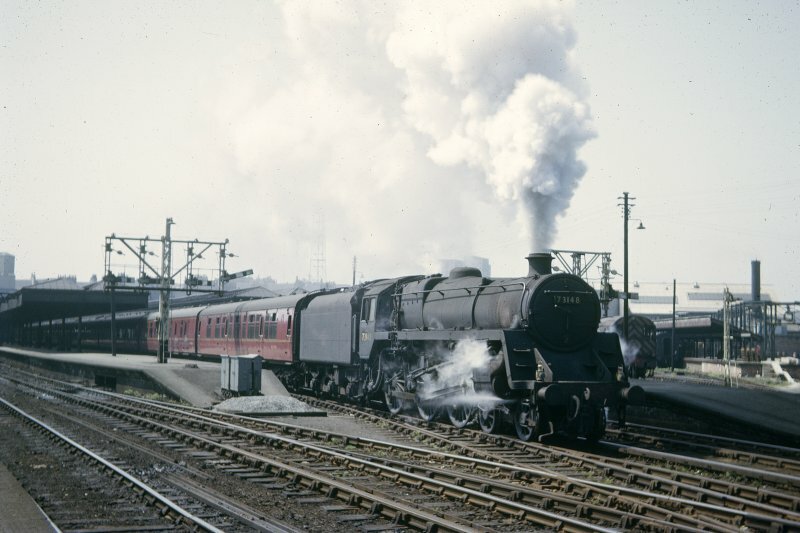 The passenger station had only five platforms, the longest being numbers 2 and 3 at 702ft (214m) and 655ft (199.7m) respectively. These were the only two that ended in front of a narrow concourse; the low roof that covered them was carried on no fewer than 69 posts. Platform 5 was totally uncovered and the shortest, at 405ft (123.5m); it was normally used for milk traffic. The limited width of even the widest platforms was a cause of constant danger, several accidents, and at least one fatality (in July 1902). Further expansion was considered in 1905 by extension onto the site of the old Glasgow City Poorhouse (NS56NE 1392), but a large and expensive warehouse was built instead, at Dobbies Loan. 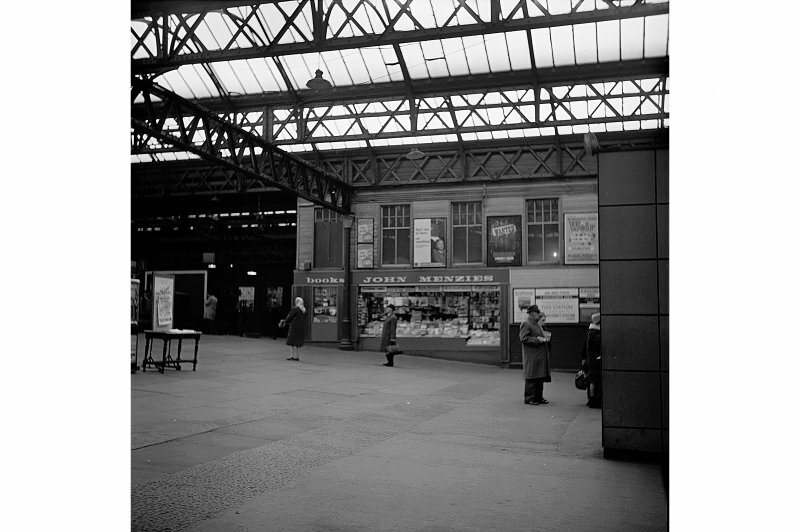 In 1932, the LMS undertook limited improvement, transferring the steel-framed glazed awnings from Ardrossan North Station (NS24SW 53) and installing a new steel-framed but wood-clad concourse. (Illustrations include frontage elevation in 1848, and plan of the passenger and goods stations c. 1920). 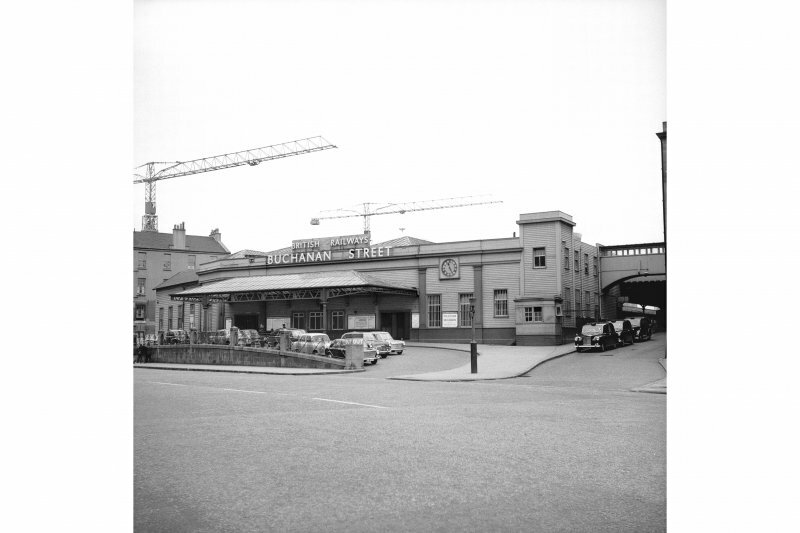 Buchanan Street Station was the second station to be opened in Glasgow, pre-dating Glasgow Central (NS56NE 77.00) by thirty years. 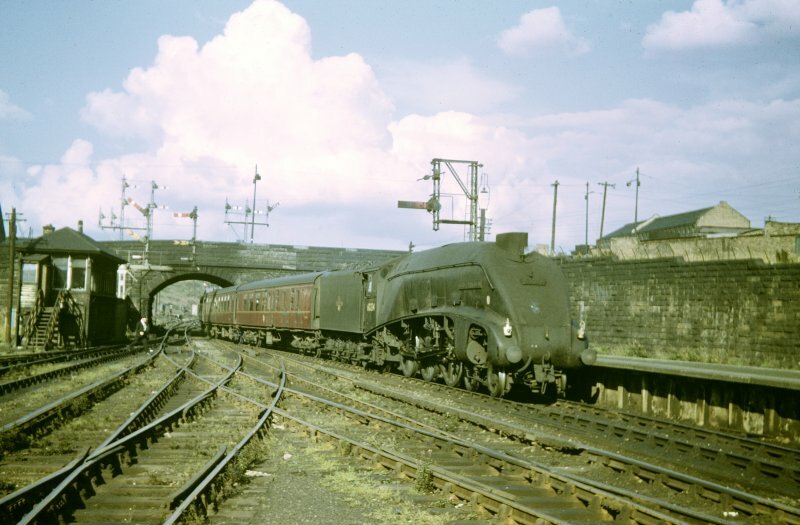 The first railway into Glasgow was the Garnkirk and Glasgow Rly, which opened in 1841 from the Monklands coalfield (E of Glasgow), to its Townhead terminus (NS56NE 2074.00) near St Rollox. This station was not well situated for the burgeoning city, and a site closer to the to the expanding centre was sought. 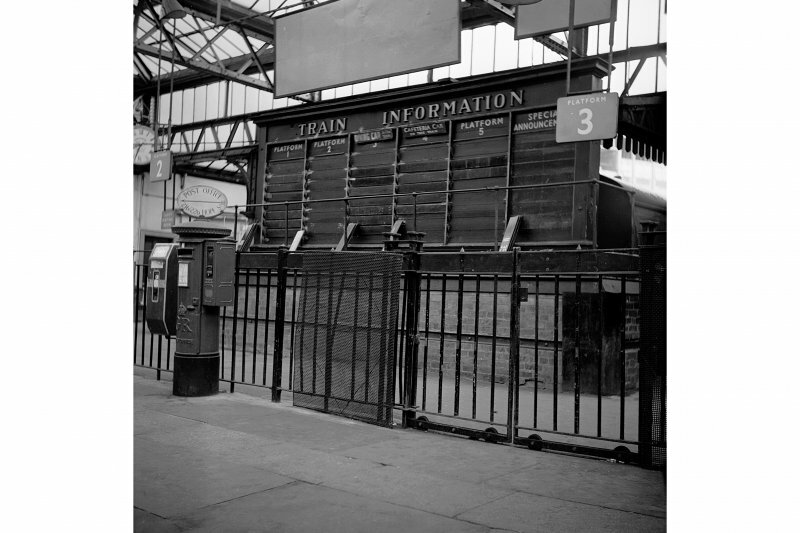 This was a new station with two platforms at the top of Buchanan St adjacent to West Nile Street, Port Dundas Road and Cowcaddens Street, and was opened by the Glasgow, Garnkirk and Coatbridge Rly (soon to be taken over by the Caledonian Rly) on 1 November 1849. The line to the new station left the GGR at Milton Junction, Robroyston, 2 miles [3.2km] to the NE, and descended on a gradient (mostly at 1-in-80) via a 400yd [366m] tunnel (NS56NE 2931) under Port Dundas (NS56NE 217.02) and the Forth and Clyde Canal (NS56NE 217.00). 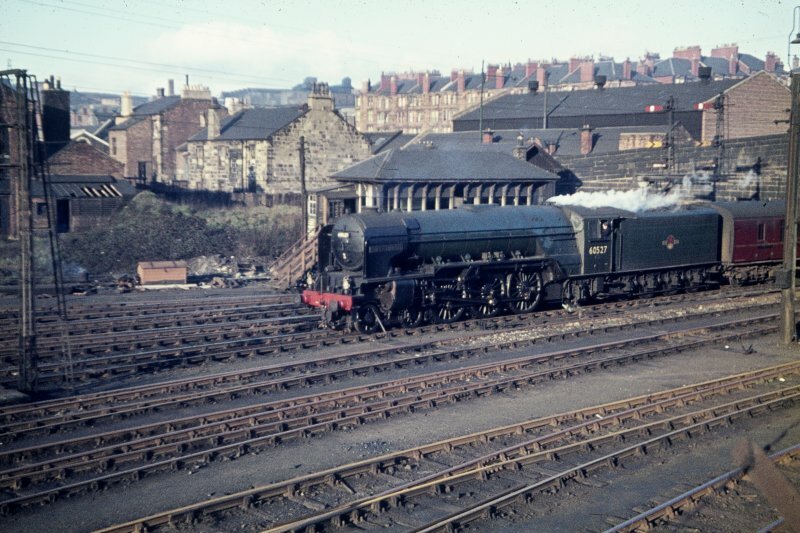 The Townhead terminus continued to be use for goods traffic until June 1968. Buchanan St was used by the Caledonian Rly's Anglo-Scottish services until its Central Station opened on 1 August 1879. 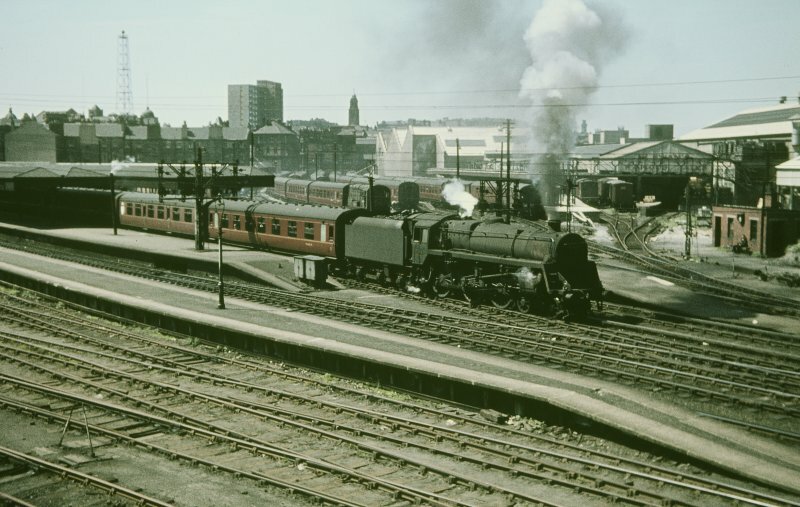 On 1 January 1850 the Caledonian Rly opened Buchanan Street Goods Station (NS56NE 2480) to the S of the passenger station; an enlarged goods station was opened on 14 June 1909. In 1854, the Caledonian Rly opened its St Rollox works (NS66NW 42), which was substantially extended in 1882. It then covered 24 acres [9.7ha] and at its zenith employed over 3,000 people. 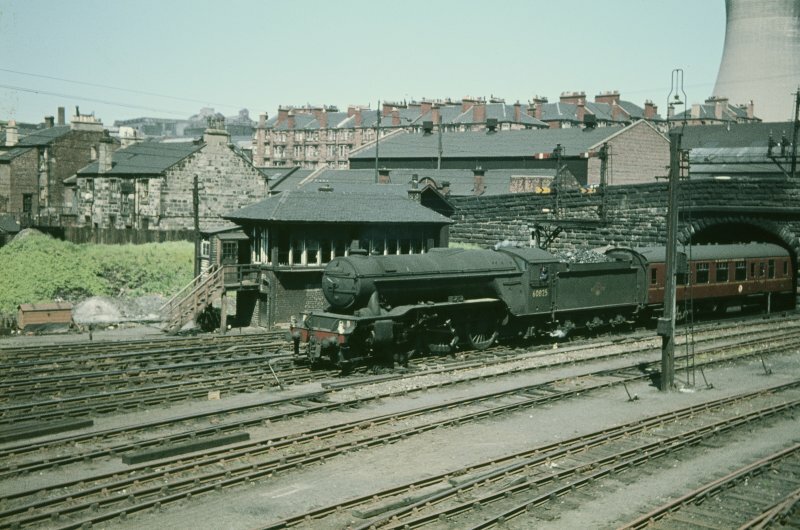 On 1 August 1883, a new station (NS66NW 243) was opened at St Rollox, on the climb out of Buchanan St and immediately adjacent to the works. 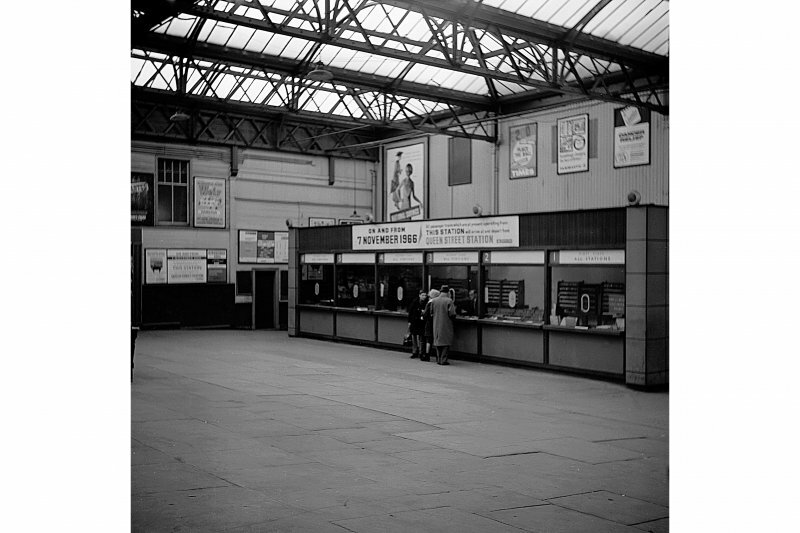 In 1932, Buchanan Street Station was rebuilt by the LMS, but it remained a drab and uninspiring building by comparison with the other Glasgow termini. 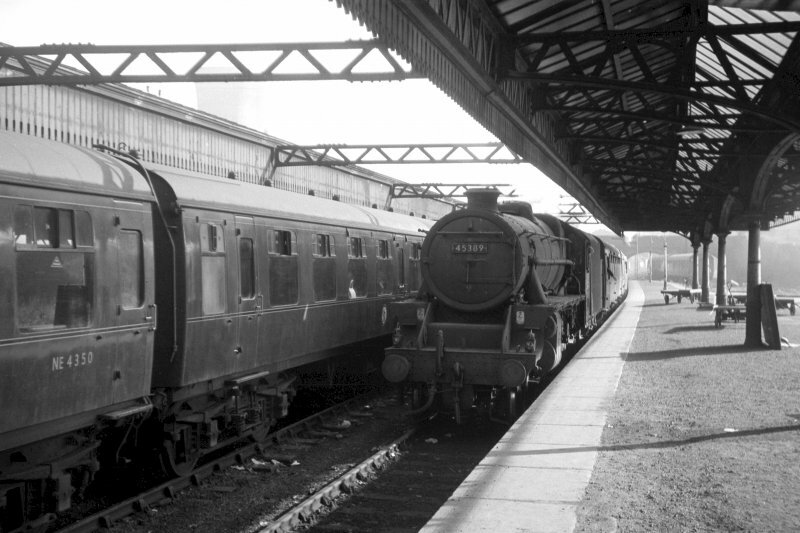 There was no overall roof or train shed, just a new glass-roofed concourse and awnings over the six platforms and these were second-hand, coming from the closed station at Ardrossan North (NS24SW 53). 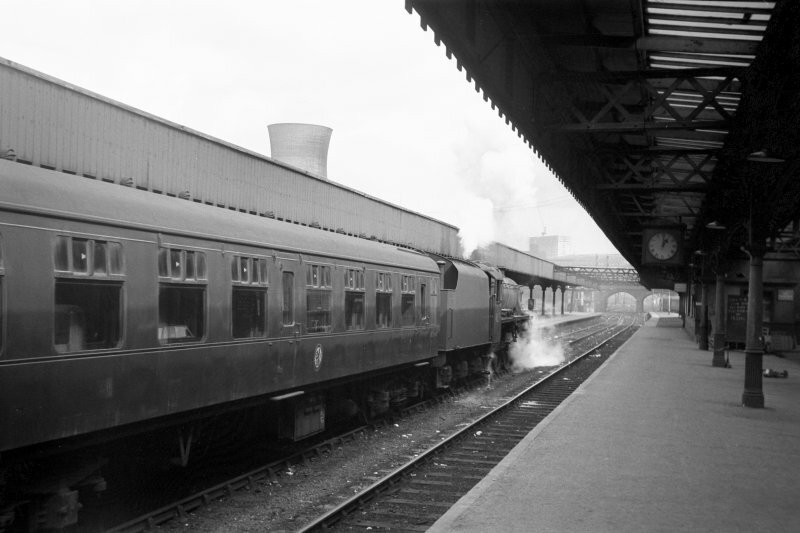 Off the small concourse were waiting and refreshment rooms and toilets. The frontage was a steel-framed structure clad in horizontal timber but with perversely classical pretensions. 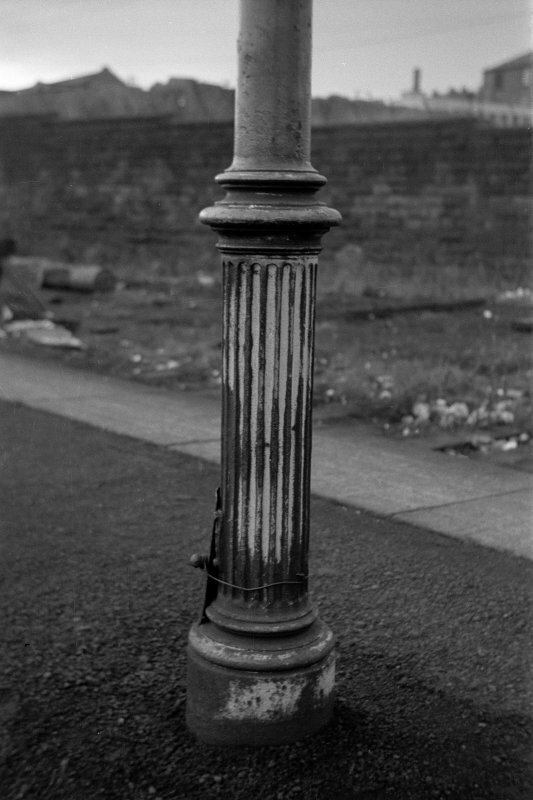 There were mock columns, pilasters, a pronounced cornice, a small tower and a glazed canopy supported by two iron columns. It was never rated highly for location, architecture or convenience. To the N of the station were carriage sidings (in use until closure), controlled by a signalbox (NS56NE 59.01) immediately W of the road overbridge [Dobbie's Loan] that spanned the tracks to the station. Between this bridge and the tunnel lay a two-road locomotive shed (again to the N of the line), which is believed to have closed in 1916; a locomotive turntable remained until closure. Just before the tunnel, there was another signalbox which, until its closure, controlled entry to and exit from the goods yard. The pattern of traffic at this station differed from that at the other Glasgow termini in that there was no intense suburban service. 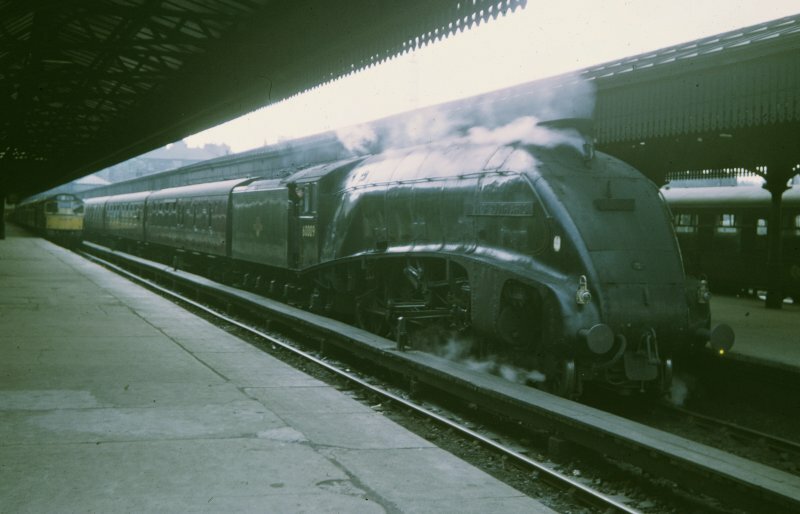 Instead, there were services to Dundee, Aberdeen, Inverness and Oban; between 30 and 40 arrivals and departures being normal on weekdays. 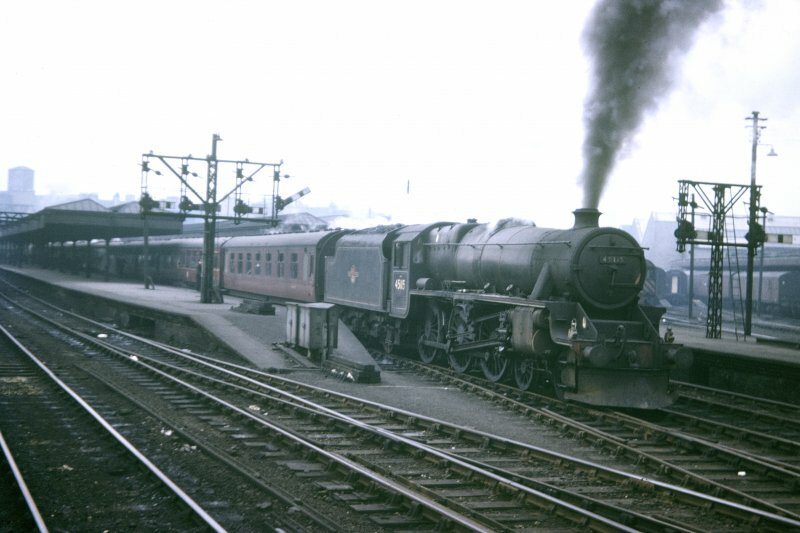 The station was also used for diverted traffic, notably in 1959 when Central station was being resignalled. 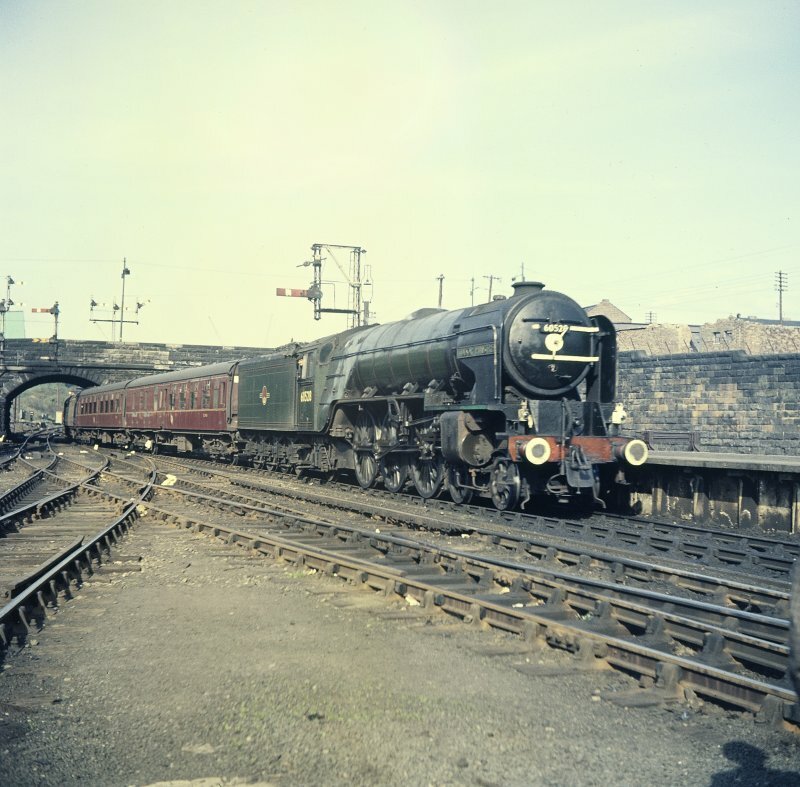 Between 1962 and 1966, the 'three-hour' services to Aberdeen (included named services) were a notable feature of the final period of steam power. The 1960's were to see drastic changes. 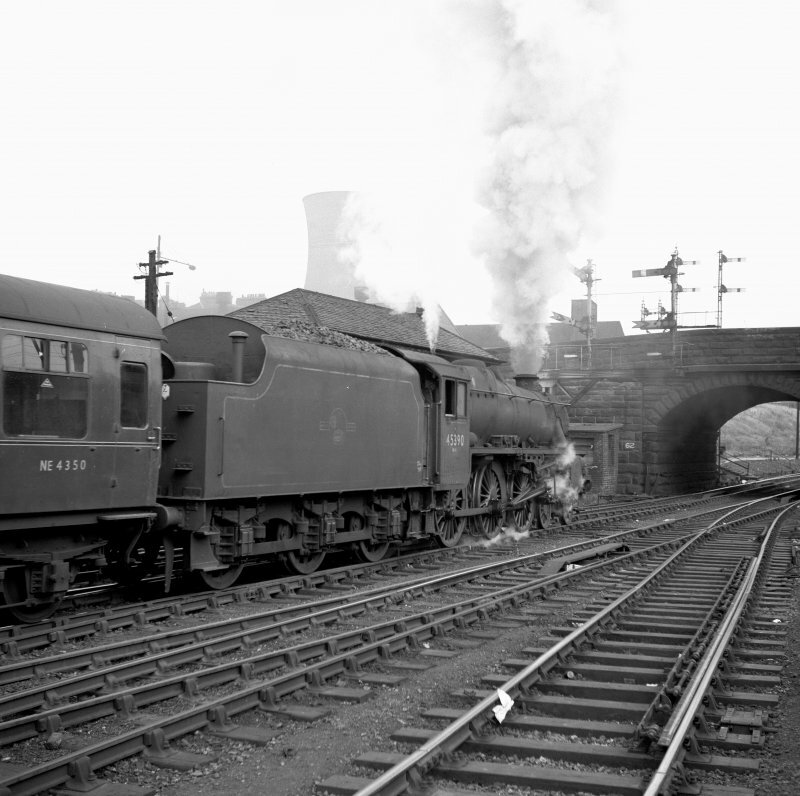 On 6 August 1962, Buchanan Street goods yard, and on 5 November St Rollox station closed. 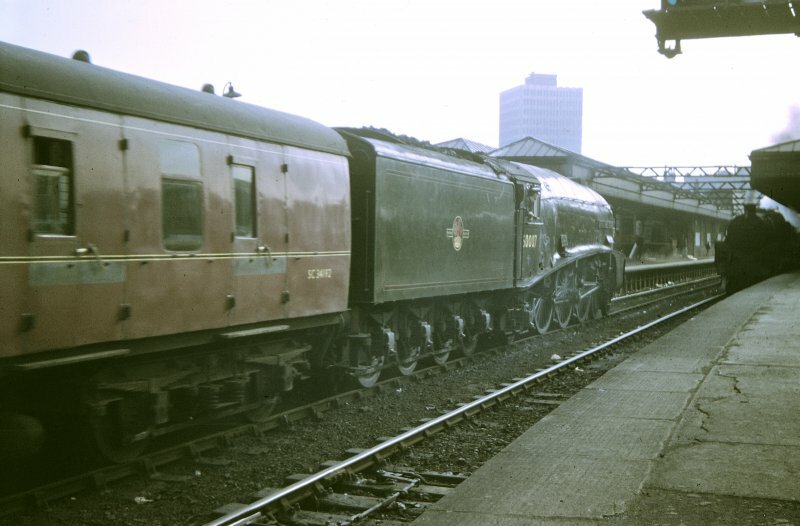 Just four years later, Buchanan Street station itself succumbed, the final day of passenger services being 7 November 1966. Not only was the station closed, but also the line as far as Sighthill East Junction, at Springburn. 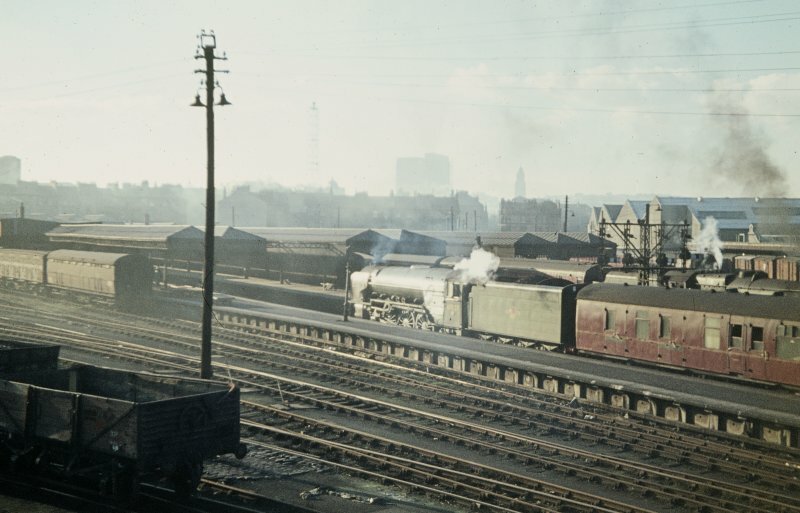 St Rollox depot closed a week after Buchanan Street Station, on 14 November 1966. 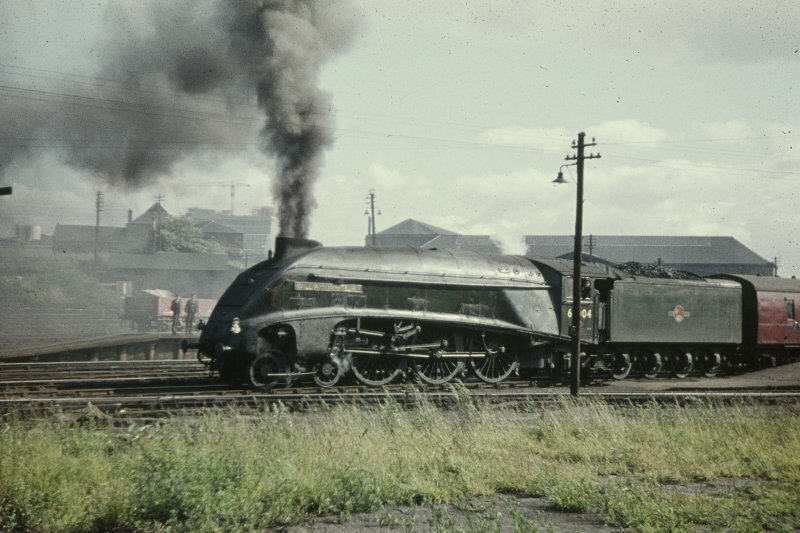 No time was wasted in lifting the tracks and demolishing the station buildings; few lamented its passing. St Enoch Station (NS56SE 69.00) having closed on 27 June that year, trains were diverted to Queen Street (NS56NE 76.00) and Central Stations. The line to Townhead survives as apart of the rail link from Sighthill East Junction to St Rollox works (now Alstom's Springburn Works). 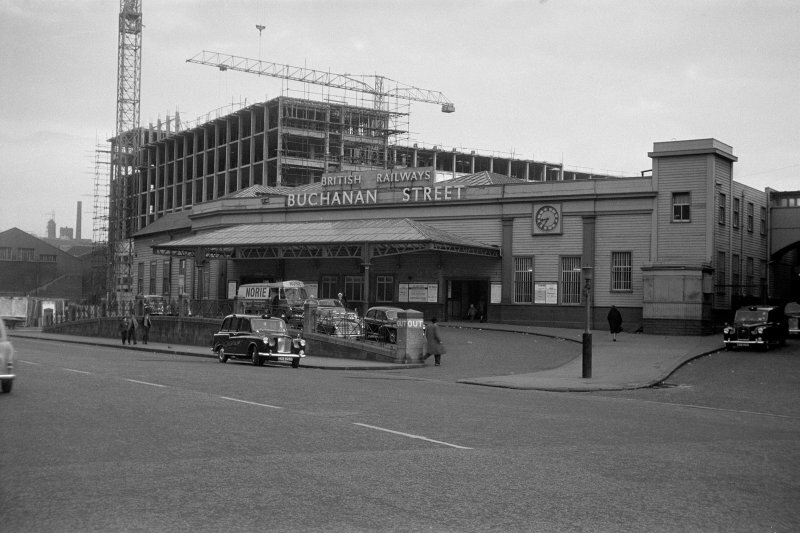 Buchanan (formerly Buchanan Street) bus station (NS56NE 146.00) occupies part of the site of the station. [Illustrations include detailed colour map of railway stations, installations and works, together with associated industrial and facilities, in NE Glasgow].